Last night Hubby, Eldest Daughter and I (Youngest Daughter is at school or she would have gone) went to see ”Hungarian Rhapsody: Queen Live in Budapest.” It was filmed in 1986 when going to Budapest meant going behind the Iron Curtain. That wasn’t the only nostalgic thing that struck Hubby and I as we watched the film. Remember when men wore short shorts? Or track suits were in? Or guitars were plugged in to speakers with cords? Hubby and I have gone to a lot of concerts in our day. As a matter of fact, we are going to see Three Dog Night tonight! But for some reason we never saw Queen. So this was my first opportunity to see Freddie strut his stuff on stage. And strut he did! Only some singers can really handle singing in front of tens of thousands of people and Freddie was one of them. Every gesture, every step, was designed to be seen in the back row. But, with this movie you aren’t in the back row, you are right on the stage where you see just what a work out playing and singing in a rock concert can be, based on the amount of sweat pouring off of Freddie! Freddie Mercury had a VOICE, an amazing, strong, powerful, unique voice. I felt a bit of melancholy as I watched that voice on display because it was silenced in 1991 by AIDS. AIDS has become, at least in this country, a chronic disease. But back then it was still oh so deadly. So if you like Queen go see the film. Enjoy Freddie and his band mates. We can miss Freddie and mourn his loss. But we can be grateful for how far we have come. It has finally cooled off in these here parts. I know some of you are thinking “Of course it cooled off, it is the end of September.” Well, that isn’t the way it works here in inland Southern California. Our summer lasts until the middle of October. This year, Mr. Summer saved it all up for us and after a cooler than normal start to the summer he came blasting into town in August and would not leave! Last night we opened the windows and nice cool air entered the house. When we went to bed I left one window open on the front of the house. When I woke up this morning I checked the house temperature and it was 72 degrees! Wow! I haven’t seen the inside of my house that cool for weeks! We rarely set the AC lower than 78, although there were a couple of sweaty nights that we went wild and set it at 77 just before bed. This morning parts of me, like my feet, were actually on the chilly side and I once again had hope that summer would eventually come to an end! Oh, don’t worry, Mr. Summer will return and heat us up again before he finally goes away for fall and winter. But, for now, I am enjoying the fall weather, however temporary. I subscribe to Vanity Fair magazine, which I just love. I don’t usually spend much time looking at the ads for the many expensive products using the pages of my favorite magazine to hock their wares. I just enjoy the stories. This month, however, the October issue of Vanity Fair came with a separate smaller magazine which contained 76 pages of beautiful things brought to you and me from Ralph Lauren. I picked it up Saturday morning for the first time to figure out if it was something that should go to the recycling bin or to the library. Ralph Lauren flagship store in New York City. As I thumbed through the pages of this amazingly expensive piece of advertising, I saw many things that made me think to myself, “If I were thinner and had much more money than I have now, I might buy some of the these clothes.” Then I got to the back two pages. They included a list of all the Ralph Lauren stores, everywhere. I noted that California, in spite of the economic down turn, has eight Ralph Lauren Stores, including six which are within reasonable driving distance of my home. Obviously Ralph Lauren and I are meant to be, when I lose 100 pounds and gain a million dollars! Then I saw where other Ralph Lauren stores are located : Kuwait City, Dubai, Bahrain, Hong Kong, St. Moritz…and they went on to list every exotic and expensive place you can think of. So while I am within striking distance of a dream Lauren wardrobe, as the crow flies, I finally had to admit to myself, it ain’t gonna happen. Even if life hands me the ability to wear and afford Ralph Lauren clothes, I am not the sort of person who wears clothes from a company that has stores in Kuwait City and Dubai. Another dream bites the dust! By the way, the 76 pages went into the recycle bin. We have a Legoland in Southern California. We only went once because it opened just as my two girls were getting a little too big to go. At that time it seemed to be designed for younger children and the girls were so big for their ages that they had a hard time fitting into some of the kiddie rides. This was not a problem unique to Legoland by the way. Everyone thought my girls were going to be over 6 feet tall but they are nowhere near that height. They got their growth out-of-the-way early, I like to say. Anyway, back to Legos. 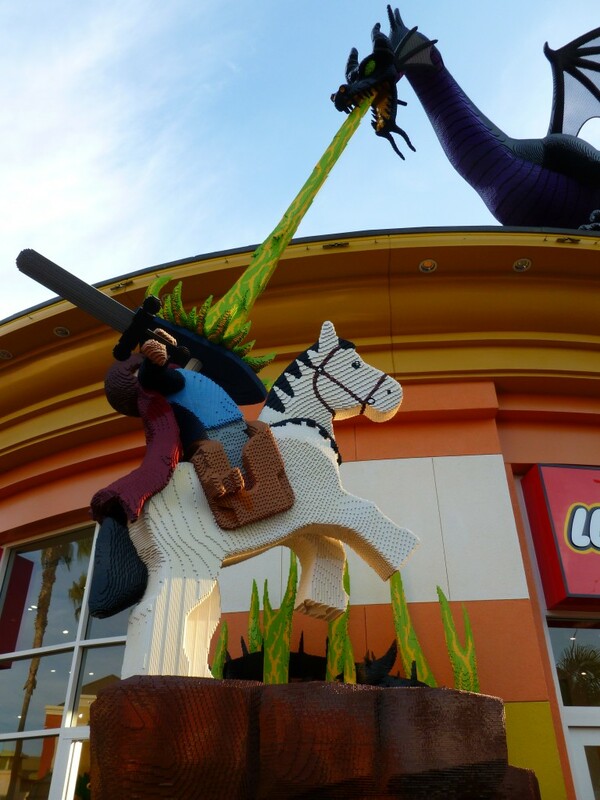 The thing I loved about Legoland was all of the sculptures made out of Legos. They were fascinating! So I was thrilled to bits when we went to Downton Disney week before last and the Lego store there had new Lego statutes. They were Disney themed, of course, and huge! Here are some photos. Enjoy! 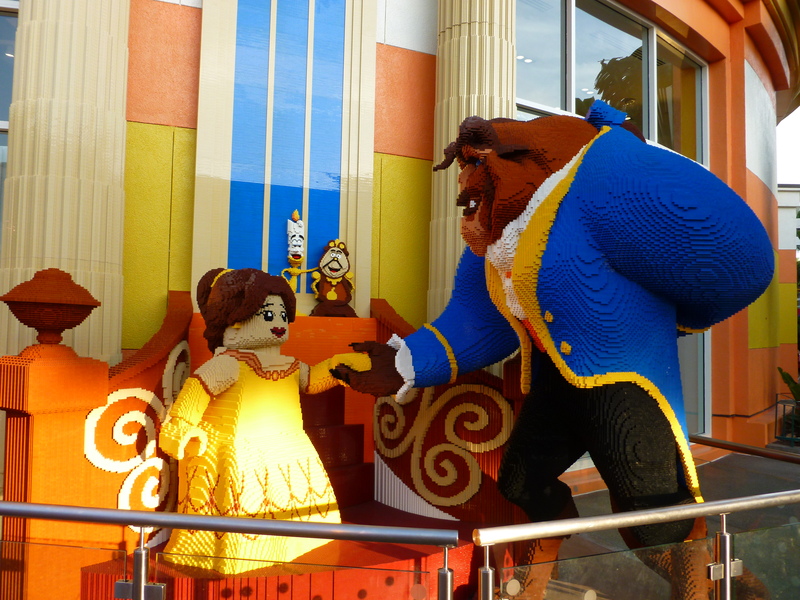 Here is Beauty and the Beast. Note the clock and candlestick above their hands. Here is a Toy Story themed diorama. Note the trees in the background. Aren’t they pretty? And totally made out of Lego! Here is Prince Phillip from Sleeping Beauty fighting the dragon. 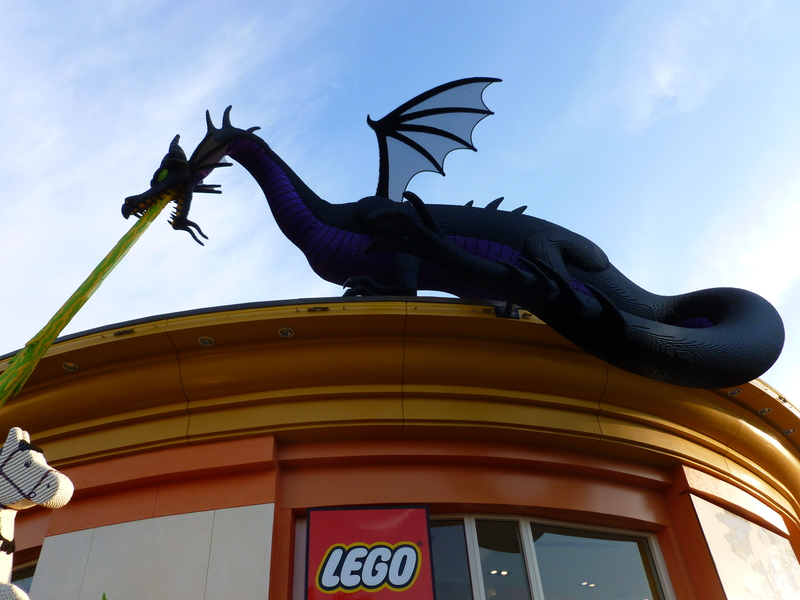 Below is a photo of just the dragon, which is huge and is perched on top of the store! 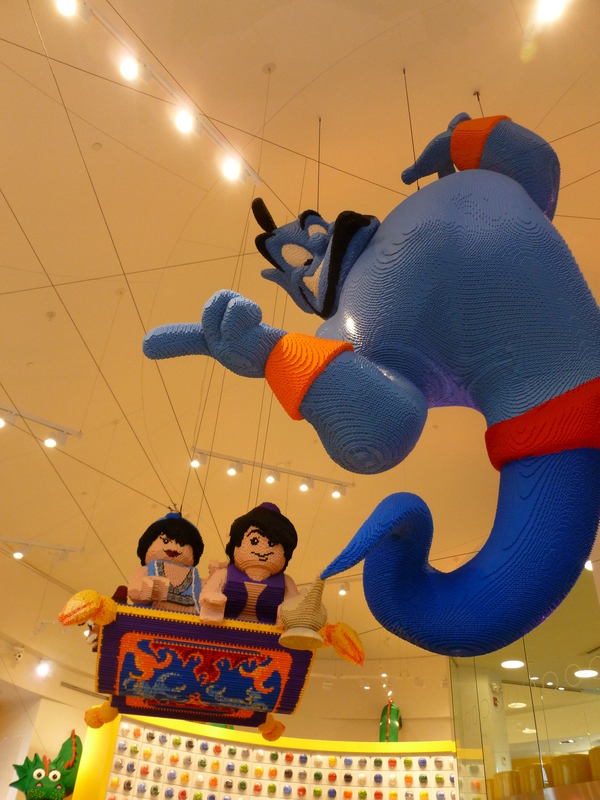 Here is the Aladdin display inside the store. I love the Genie with its face inspired by Robin Williams. The rug Aladdin and Jasmine are fling on was pretty awesome, too! I have to say, female faces do not seem to be the Lego designer’s strong point. Jasmine and Belle (in the first photos) are a little round in the face…. For years, I mean YEARS, I have remembered a TV show from my childhood that no else remembers. Well, Hubby remembers it, too, which is one of the many reasons I married him. But no one else does. It was about a man who was buried in ice and when found many years later, was revived. He went to live with, I thought, his grandson. Needless to say the plot revolved around this fellow adapting to a world that was very different from the one he was living in when he was frozen. I have mentioned this show to people on and off for years and they all look at me like I am a little crazy. Yesterday I was reading a post from Emily at The Waiting about a movie she and her husband have been trying to identify for a very long time. You can find it here http://notthehardestpart.wordpress.com/2012/09/16/witness-me-as-i-lose-my-mind/ It motivated me to find my long-lost television show. The Internet being the crazy amazing wonderful thing that it is I found it in just a few clicks. I don’t know why I haven’t done this before! 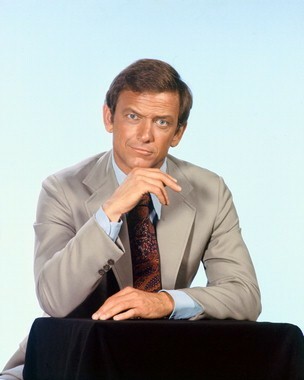 The TV show that has been driving me crazy (and making me look crazy) for so many decades was called “The Second Hundred Years.” It starred Monte Markham. The plot was almost as I remembered it. Luke Carpenter, after being buried in ice and snow for 67 years, is found and returned to his son, who is about to enter a senior citizen’s complex. There was also a grandson who, in a twist, looks just like his grandfather and was also played by Monte Markham. The show premiered on September 6th, 1967 and was cancelled in March 1968. The weird thing is I was only 6 years old when this show came on, turning seven by the time it was cancelled. I barely remember anything from my childhood, so why do I remember some obscure TV show that was only on for 6 months when I was 6? Oh, the mysteries of the human brain! Hubby was quite interested in my findings, as probably the only other human being in American (besides Monte Markham himself) that remembers this show. He was only 7/8 himself when the show was on. Apparently the idea of being frozen and resurrected decades later was a profound concept to two little kids growing up in Southern California in the 60s! So, Whew, got that mystery solved! Now maybe I can move on and do something else with the extra brain capacity I have now, like creating world peace, instead of obsessing over obscure old TV shows!!!! 1. I can’t afford to live at the beach. 2. It doesn’t snow here. No matter how hot it gets, I don’t have to shovel anything to get my car out of the driveway. 3. Did I mention it doesn’t snow here? 4. My family is here. My Hubby might not like it if I moved someplace else. He owns a business here and can’t move. 5. I do quite a bit of writing about my area’s history. If I moved somewhere else I would have to start all over with a new history. Yep, that is all I could think of with my heat fried brain. Hope it is cooler where you are! The whole family went off to Downtown Disney on Saturday evening. I guess we hadn’t had enough Mickey Mouse in our lives and since Downtown Disney is free and Disneyland costs $87, it is certainly the place to go for a dose of Disney Magic without the hefty price tag! Parking for Downtown Dis\ney is free for the first three hours. You can get an additional two free hours of parking with validation from “participating stores.” We have been there many times so three hours is more than enough for us to do a circuit of the shops. If you plan on eating there and looking at the shops, too, then you may need more time. Each additional hour costs $6.00. I fully admit that my family enjoys window shopping, so Downtown Disney is perfect for us. We like to poke around in the shops, admire the merchandise,and soak up the Disney atmosphere. The girls and I like to go through the huge Disney store to see what they have managed to put Mickey on now. Hubby, bless him, tolerates our oohs and aahs. If you like pin trading then the Disney store is perfect because there are always at least a few employees wearing a lanyard full of pins and, again, you don’t have to pay to get into the park to enjoy that activity. Another fun store (which my Hubby enjoys much more) is the LEGO store. They had a whole area set up outside the store with tables and LEGO which was being enjoyed by a number of families. 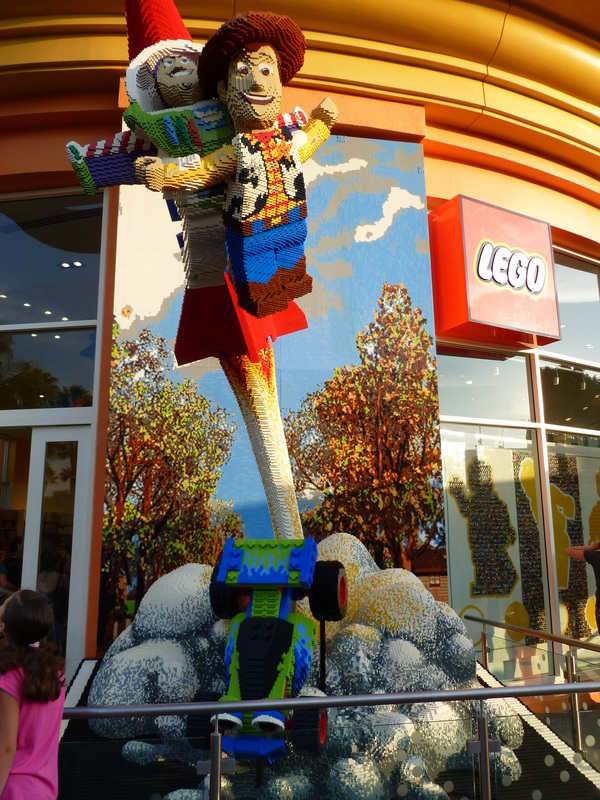 They also have added two huge displays constructed of LEGO to the outside of the store and one inside the store, all with a Disney theme, of course! I will be posting photos of those on another day. Since it was Saturday night there was more entertainment but there were also more people, LOTS of people. If you prefer a less crowded experience I suggest you go earlier int he day or on a weekday. My only complaint about Downtown Disney, ever since it opened, is that it is lacking in casual, won’t cost an arm and a leg dining places. We usually go on the spur of the moment and we do not like to pay a huge amount for dinner for the four of us. They are finally trying to remedy that. A new restaurant called the Earl of Sandwich is ging in even as I type. Several pf the existing restaurants have expanded their outside (and more casual) dining areas. Or you can do what we often do which is eat before we arrive. So, we were once again filled up with the magic of Disney. For Hubby and me the magic was even more magical because it didn’t cost a dime! Youngest Daughter moved back to college this past weekend. She is living in what her school calls the “suites” but I call an apartment. As far as I can tell it has every attribute of an apartment except for an oven, so whatever its name, I will refer to it as an apartment. Last year she lived on the second floor in a four person apartment. It was set up well and had lots of storage including a storage room by the front door that was so big it could have been the bedroom of a fifth roommate. Mind you there were other issues last year, but everyone who went to college has the crazy roommate story, right? This year she is in an apartment on the first floor. All first floor apartments are designed to be “handicapped accessible.” That is perfectly fine, except there are some things that just make no sence, especially if you are handicapped. It leaves a mother to wonder, who designs these things???? 1. There are no cabinets under the kitchen sink or adjacent counter, so a person in a wheelchair can roll right up to the sink. Mind you, the sink is still at the normal height, so I have to wonder if a person in a chair would be able to use the sink, but they would be able to get nice and close to it!! 2. There are cabinets under the stove, so I guess it is important for the handicapped person to reach the sink, but not their food on the stove. 3. The bathroom has absolutely no storage except for a medicine cabinet up over the sink, which a person in a wheelchair could never reach. The sink is just that, a sink, and has no counter space on either side of it. So, this has led me to the conclusion that whoever designed the bathroom thinks that handicapped people have no need for either storage or counter space in a bathroom. Huh? YD’s roommate’s mother bought them a set of plastic shelves, thank goodness. Wouldn’t a person in a wheelchair have just as much need for bathroom storage as anyone else? 4. The bedroom came with a small dresser with four shallow drawers. It came with a crazy long closet, with a bar at normal height. It came with a desk with no drawers, except for one shallow one in the middle. So, again, I have to conclude that the person who designed the bedroom, combined with the person who bought the furniture, thought that a person in a wheelchair does not need storage because, somehow, they are going to hang all of their clothes in a closet that is out of their reach. They also have no need for desk storage as, I guess, they will be putting all of their desk things in one shallow drawer or on top of the desk. 5. The livingroom is the smallest room in the apartment and it is filled with large furniture. There is a loveseat, an oversized chair, a coffee table, and two end tables, in a room the size of a postage stamp. A person in a wheelchair would have to ask for most of the furniture to be removed just to be able to get into the room. And, really, what college student needs a coffee table? In conclusion, a mother did not design the apartment my YD is now residing in. Handicapped accessible? Maybe. Handicapped usable? Heck no! We do not have particularly large animals. I admit that Blackie is a big cat,but, compared to, say, a St. Bernard, he isn’t that big. Honey is about 35 pounds. Not a five pound chihuahua but not a large dog by any standard. 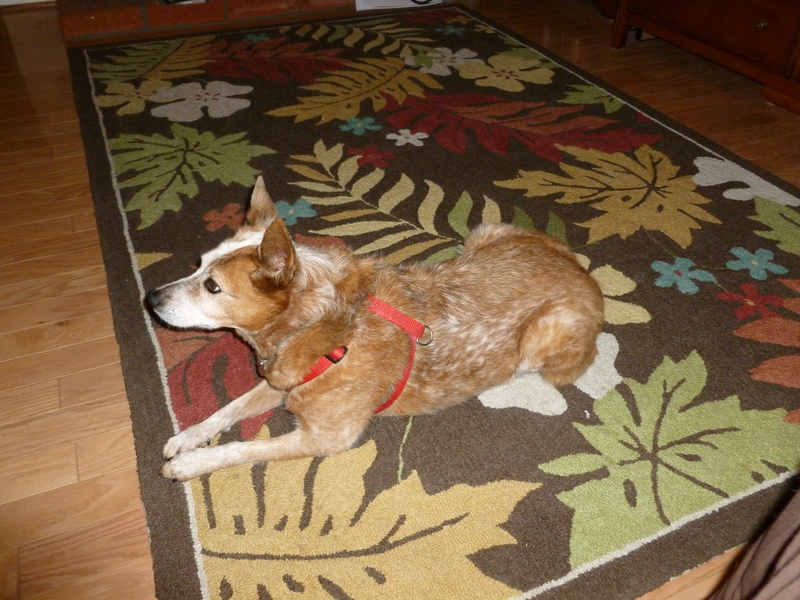 So why are my wood floors overrun by animal hair? A few people visited our home last weekend. I swept. I vacuumed. I moved some (although I admit not all) furniture. As the first two visitors entered our home I saw a tumbleweed of stray fur the size of a dessert plate just hanging out on the floor. I was so embarrassed! Based on the amount of fur I can see right now on my floors, I don’t understand why my pets are not bald. It is another one of those mysteries of life…. 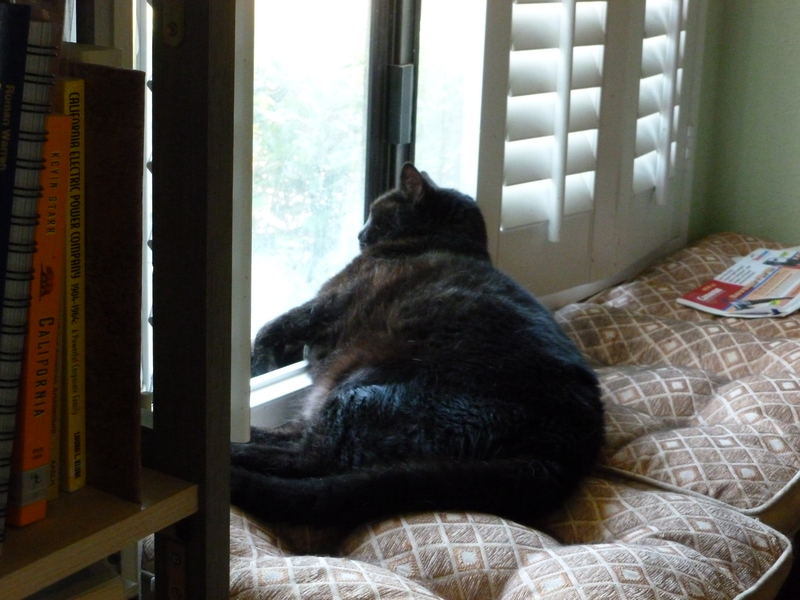 Blackie, in one of his favorite spots, on the window seat, trying to turn my tan cushions black with fur. At least that fur isn’t on my floor! Honey, so cute and yet so furry! Many years ago I went to a workshop on church growth. One of the things I learned that has always stuck with me is that people are most receptive to new things and change two times every year – January, because of the new year, new year’s resolutions, etc…, and when school starts, because, again, it is a time of fresh starts and new things. Well, my household is about to enter that school starting, big change time once again, for the 18th time. Youngest Daughter is moving back to school this weekend so she and I have been busy getting things ready. Day before yesterday we went shopping. I haven’t had such a marathon shopping trip in a very long time! Jeans, tennis shoes, some things to stock her pantry, plus a couple of side trips to a Hallmark store going out of business and a thrift store. We staggered home over 5 hours later and I collapsed. Eldest Daughter is also getting ready to start school. Last night we discussed classes and possible schedule changes with her. I will have to find out what her jeans situation is soon and see if I need to go shopping again, hopefully for a shorter length of time! Since both girls are in college it is a melancholy time of year for me, but certainly one where I see change, big change (such as an empty nest) coming around the bend. I am not sure it makes me more receptive to new ideas, but it certainly makes me more receptive to chocolate!! !